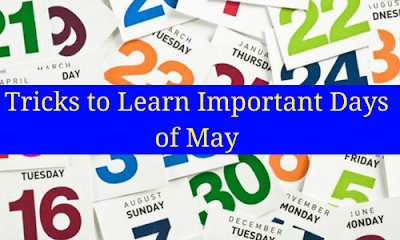 Trick to remember important days of May. On 1st Labour Day, 2 astronomers received 3 press freedom prizes 4(for) fighting against fire. 5 athletes on 8th Red Cross day took steps for developing 11 technologies in 17 telecommunication, 18 museums, 20 Metrology and 22 Bio-diversity to counter (anti) attack terrorism. 12 Nurses on 10th world Mothers day took care of 15 families of 29 UN peace keepers who were suffering from 12 hypertension, 19 Hepatitis, 25 Thyroid, 31 Tobacco diseases.